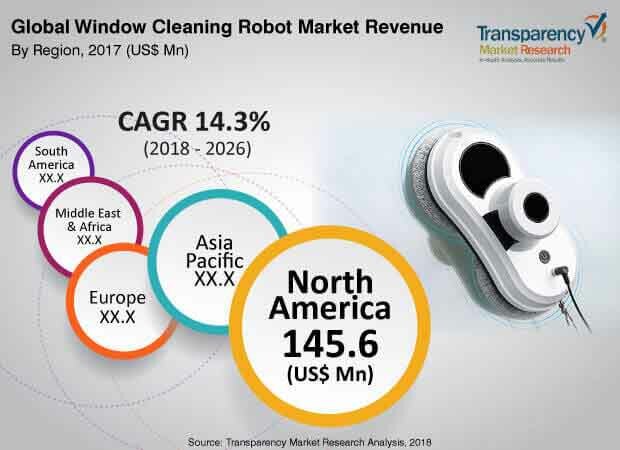 The global window cleaning robot market was valued at US$ 376.7 Mn in 2017 and is projected to expand at a compound annual growth rate (CAGR) of over 14.3% from 2018 to 2026, according to a new report published by Transparency Market Research (TMR) titled ‘Window Cleaning Robot Market – Global Industry Analysis, Size, Share, Growth, Trends, and Forecast, 2018–2026.’ This is mainly due to an increase in adoption of automation in household applications across the globe, which is likely to boost demand for window cleaning robots. Moreover, rise in safety concerns is expected to propel the global window cleaning robot market over the forecast period. Furthermore, growing advancements in robotic technology across the globe is projected to fuel the window cleaning robot market in the coming years. The global window cleaning robot market has been segmented based on product type, application, and geography. In terms of product type, the market has been divided into vacuum suction and fan absorption. Based on application, the market has been classified into commercial, residential, and industrial. Based on geography, the market has been segmented into North America, Asia Pacific, Europe, Middle East & Africa, and South America. The ability of fan absorption based window cleaning robots that can be used with a comparatively intelligent, secure, and efficient manner is one of the leading factors driving the fan absorption segment. Additionally, the application of fan absorption in tall buildings is projected to boost the segment. The increasing construction of tall buildings and the rising need for safe practices to get them cleaned is having a positive impact on the global window cleaning robot market. The fan absorption segment of the global window cleaning robot market is projected to expand at a rapid CAGR of more than 15% from 2018 to 2026. In terms of application, the residential segment is anticipated to constitute a dominant share in 2018. The segment is expected to be driven by factors such as the rising adoption of smart homes. Additionally, with the growing adoption of a comfortable, easy, secure, and convenient lifestyle, the penetration of window cleaning robots is increasing in the residential sector. Furthermore, the significant use of fan absorption based window cleaning robots in the commercial sector is causing it to expand at a significant CAGR of above 14% during the forecast period. In terms of geography, the global window cleaning robot market has been classified into North America, Europe, Asia Pacific, Middle East &Africa, and South America. The significant presence of prominent players such as Ecovacs Robotics Co. Ltd., Hobot Technology, Inc. and Zhengzhou Bangmi Smart Technology Co., Ltd. in the Asia Pacific region is likely to contribute to the prominent market share of the region during the forecast period. Some of the other key players operating in the global window cleaning robot market are Mamibot, Inc., Windowmate, Cop Rose Robot Co. Ltd., Alfawise, Iishim Global Co., Ltd., Baseltek, and ALBOHES.